Please contact us via email if you would like to purchase this item. 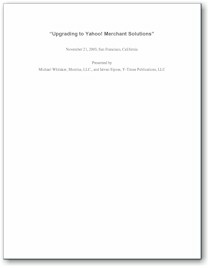 This is the handout that accompanied our "Upgrading to Yahoo! Merchant Solutions" seminar in San Francisco, 2003. FOR UP-TO-DATE CHANGES regarding Merchant Solutions and the transition, please be sure to read our Merchant Solutions Q & A. Yahoo! announced some changes since our seminar. "Upgrading to Yahoo! Merchant Solutions"
What's New In Merchant Solutions? Upgrading to Merchant Solutions: What are your Options? The bottom line: how much will it cost? SPECIAL NOTE: When you purchase this e-book, on the order confirmation page you will see a red button next to this product. You will need to click that button to retrieve your e-book. Electronic publications are not shipped. Adobe PDF Document, 19 pages. Requires the Adobe Acrobat Reader available free of charge. Click the logo below to get Acrobat.